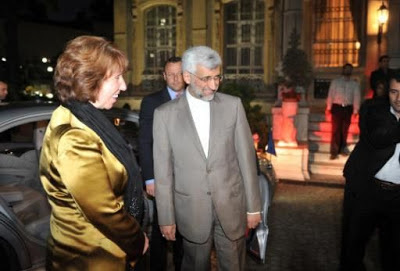 Iran’s chief nuclear negotiator Saeed Jalili announced on Wednesday that Iran will soon hold nuclear talks with world powers. Jalili made the comments after holding talks with EU foreign policy chief Catherine Ashton in Istanbul. Jalili, a candidate for president in the upcoming election in Iran, said regardless of elction results, Iran will never abandon its right to enrich uranium. “Even after the elections in Iran, the people of Iran will not allow their right to enrichment to be taken away,” Jalili said, adding that the world powers should lift the international sanctions against Iran. Meanwhile in Vienna, the talks between Iran and the IAEA, also on Wednesday, ended with no concrete results on resolving issues surrounding IAEA access to Iranian sites and documents. UK based academic Ivanka Barzashka, an academic at King’s College, London, has found from analyzing data collected by the International Atomic Energy Agency that the Stuxnet malwork attack in 2010 exposed vulnerabilities in Iran’s uranium enrichment facilities that would otherwise have gone unnoticed. Production actually went up in the year after Stuxnet was discovered. Furthermore, the impression in the West that Natanz was under virus attack left the Iranians free to quietly enrich more uranium and hindered diplomatic efforts to hold back a nuclear Iran. Barzashka maintains that Iran has improved centrifuge performance and is enriching uranium to higher concentrations than ever before. Iranian experts have also strengthened defensive capabilities against cyber or hacking attacks. Iran has invested substantial resources in creating a cyber command to deal with a variety of computer security issues. The never ending story of 'IRAN Nuclear Talks' between the great nation of IRAN and the world's powers of the most arrogant, boastful and bully nations of the 5+1. That's for sure! A british study has concluded that the iranian government is really undemocratic. Iran should avoid holding these talks till after the election. If khamenei has decided to change course...he will do it thru the new administration. These talks will be used as propeganda to blame iran on not taking talks seriously. I really think khamenei should start the transition into a religious figure head and a guider as oppose to the ultimate ruler of iran...he can still be relevent similar to the british royal family...but in his own way. I fear a lot of people are losing that tiny bit of religion that they had in iran. Which is sad. Yet the Obama administration is no closer than its predecessor to accepting safeguarded enrichment in Iran. This is partly due to pressure from various allies — Israel, Saudi Arabia, Britain, France — and their American supporters, who expect Washington somehow to defy legal principle along with political reality and compel Tehran to surrender indigenous fuel-cycle capabilities. But the real reason for US obstinacy is that recognizing Iran’s nuclear rights would mean accepting the Islamic Republic as a legitimate entity representing legitimate national interests. No American president since the Iranian Revolution — not even Barack Hussein Obama — has been willing to do this. Washington’s unwillingness is grounded in unattractive, but fundamental, aspects of American strategic culture: difficulty coming to terms with independent power centers (whether globally or in vital regions like the Middle East); hostility to non-liberal states, unless they subordinate their foreign policies to US preferences (as Egypt did under Sadat and Mubarak); and an unreflective but deeply rooted sense that US-backed norms, rules, and transnational decision-making processes are meant to constrain others, not America itself. Congratulations for your good analysis related to the prospective outcomes. I also doubt that Obama's mind and the American mentality will embrace any logic, that is hampered by their unreasonable attitudes that "we know better" and that "no one will tell us what to do". Most of the US decision makers and the public; brainwashed by the certain propaganda, cannot understand that negotiating (for example) with the DPRK, during the 1990s in good faith, would bring today, many cheap North Korea made goods to their Walmart and other stores. They wouldn't have also to spend money for "intimidating" military exercises in South Korea etc. and there were no nuclear weapons in the DPRK possession. The same applies to the US relation with the Islamic Republic. Should American attitude follow a logic and a good faith reasoning, then the American population could enjoy cheaper oil prices, due to increased oil supplies, as well as cheaper prices in their food and merchandise stores. Islamic republic would buy their Boeings too. The Supreme Leader has been calling for that logic from the US, but it looks like the American lobbies pull the strings in those matters, and that can be seen by the statements from certain and important officials which include J. Clapper. no one in the world really gives a crap about the pulings of the Leveretts, fanboy, and anonymous or not, when pushing their pule, you're not pulling any wool over any eyes. keep telling yourself that I'm not telling the truth. the Leverett's book was published to enormous indifference except from those assigned to review it, most all of whom scoffed at the illogic.